After BTS topped the Billboard 200 albums chart -- a feat previously thought impossible for a Korean artist -- people started wondering what makes the group so special. The Korean music scene has been rolling out an endless parade of young, good-looking singers with top-notch dancing skills, none of which had been able to crack into the mainstream Western music market. “BTS is extremely talented and produces quality music, but there had been those who can sing just as well, dance just as well and are just as handsome. People have been baffled at why (global) fans are suddenly exuberant about this particular group,” said Lee Ji-young, a professor of philosophy at Sejong University. The author of “BTS Art Revolution” seeks the answer from the messages the group sends, how it resonates across generations, and its interactions with fans. She focused on the unique relationship between BTS and its global fandom Army, how the group fuels individual fans to take on a more active role and cultural changes the BTS fever may herald. “Anyone aspires to fight back against the social oppression they face, and BTS’ message speaks to those listening, whether they are in their teens or in their 40s,” Lee said. “No More Dreams,” BTS’ first single, speaks of the expectations that every Korean student faces from society. What the members sing of is the anxiety, fear and frustration people feel throughout their lives. As the desire to act out against oppression -- whatever that may be -- is global, BTS’ message is universal, she said. The group’s lyrics are critical and cynical of the system created by those in power, and urge those listening to hold on to hope. These messages evolve as they go along, with the “Love Yourself” series presenting alternative solutions to those frustrated with reality, Lee said. This is in line with the message of “Speak Yourself” that the band’s leader RM delivered at the group’s address to the UN last month. While there have been many Korean musicians critical of society, BTS’ messages deal with issues that people can relate to around the world, ones that “are needed in today’s society,” according to Lee, and that is the value of equality and integrity. While the messages are themselves important, BTS does not leave the fans to just take in their words. “BTS is famous for sending clues for fans to solve in the content, whether it be speeches, music videos or mere mentions,” Lee said, sparking fans to take part in a journey down the rabbit hole into jam-packed metaphors and cultural references. 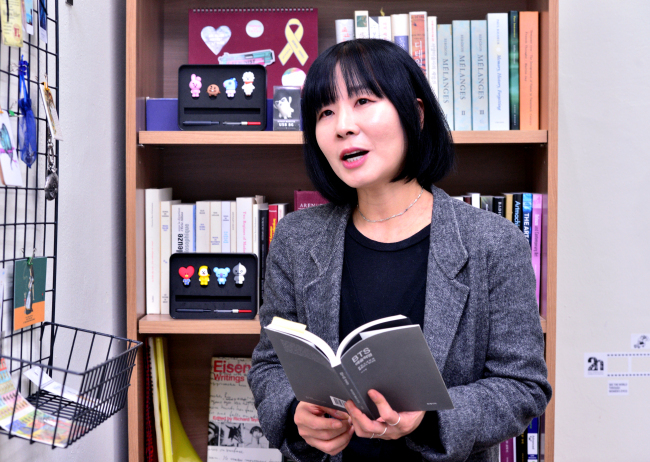 She mentioned a case of an Italian fan who uploaded a 10-minute video report on the symbolism of the music video for “Spring Day,” which included a mention of the tragic sinking of the ferry Sewol in 2014 that claimed 300 lives, most of whom were high school students. Lee said the active translation and analysis via social media by fans allow them to connect with other fans across the world. “Seeing that what someone else in another country believes to be a better world is not different from what I believe, this helps fans feel like they’ve acquired many comrades in the world,” she said. This relationship is not just among fans, she pointed out. From very early on in their careers, the seven bandmates of BTS have worked to build a connection with the fans by constantly uploading videos and messages that are sometimes very personal. They have shared their intimate stories, giving viewers the feeling of being closer to the stars. This strategy is different from that of other K-pop stars and agencies who often attempt to maintain an impeccable image personally and professionally. BTS, to the contrary, actively tries to deliver the message they are human, just like anyone else. Being a Gilles Deleuze scholar, Lee said that BTS and Army form a “Rhizome-like” relationship. The Rhizome was a concept used by Deleuze to explain a theory and research that very roughly can be explained as allowing nonhierarchical entry and exit points in data representation and interpretation. BTS fans feel like they are friends, associates and sidekicks on the journey, which pushes them to get more involved. Lee mentioned the case of BTS’ first appearance on “The Ellen DeGeneres Show” last year, which was a major turning point in the group’s entry into mainstream US consciousness. Fans had actively contacted the producers of the show to interest them in the group, she said. Traces of BTS’ appearance on “Ellen” can actually still be found online, with members sharing ideas about what hashtag they should use. Lee pointed out that one of the reasons the global Army fan group feels so involved is because they are. Unlike most K-pop idols whose popularity spilled over from Korea to other parts of the world, the global popularity of BTS grew with that inside Korea. This, the professor said, is part of what differentiates BTS from other K-pop groups. The dynamic between fans and artists takes on a very different form compared to other K-pop stars. Lee also emphasized that messages that people can relate to -- which BTS has never shied away from -- are crucial. She said agencies that just focus on what appears on the outside are going about it wrong, adding that dancing, singing and good looks are not what got so many people of different ethnicities and backgrounds to get behind BTS. “Rather than to get hung up on teaching the skills, I think they’d be better off telling them to read. Because the idea (of BTS’ music) is what’s important,” she said.